Have you lost two or more teeth in a row? Numerous consecutive and nonconsecutive teeth? Are you fully edentulous (without teeth)? It’s time to start repairing your smile. Following extensive tooth loss, patients can struggle with confidence and comfort when performing the simplest task like sharing a smile with a friend. Don’t let a damaged smile hold you back for even one more day, your trusted dentist in Daytona Beach and the Indigo Dental team offer a complete range of dental restoration options to ensure you can speak and smile with confidence and eat all of your favorite foods in complete comfort. Ready to get started? Call Indigo Dental at our dental office in Daytona Beach to schedule a tooth replacement consultation. To replace one or more teeth in a row, we use a fixed bridge. Traditional dental bridges are composed of a replacement tooth or teeth fused on both sides to dental crowns. The crowns are designed to fit over surrounding health teeth, filling a gap in the patient’s smile. If you have lost several consecutive and nonconsecutive teeth, we will likely recommend a partial denture. To create your partial, we will design a denture base that fits snuggly between healthy teeth, filling the gaps in your smile. This base material will provide the necessary support for your replacement teeth. 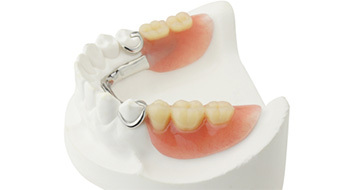 The entire prosthetic will be anchored in place using clasps that attach your partial to remaining healthy teeth. 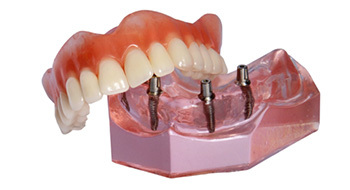 If you have no healthy teeth remaining, we will design and craft a full denture. These restorations, like partials, use a gum-colored base to support the replacement teeth. Because there are no healthy teeth remaining to provide support, the denture base will need to be shaped to fit over the top of your gum line. A close fit creates suction that should hold the denture in position all on its own, but many patients also use a small amount of denture adhesive to improve the stability of their denture. Two or a few consecutive teeth – two dental implant posts are positioned to support a row of replacement teeth, creating an implant-retained fixed bridge. Two or more consecutive and nonconsecutive teeth – two to four dental implants posts are positioned to support a partial denture, filling gaps in your smile. Full row of lost teeth – between four and six dental implants posts are strategically positioned to support the full denture, recreating your lost smile. Longevity – implant supported prosthetics will last for two decades or longer with proper care. 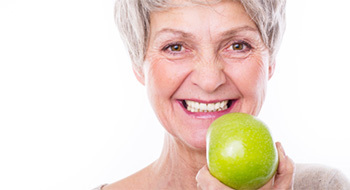 Stability – implant dentures return 70% or more dental function, allowing patients to eat all of their favorite foods without worrying about a slipping, sliding denture. Natural-functioning – closely mimicking the natural function of a healthy smile, your implant-retained bridge, partial, or full denture will be fully self-supporting, protecting healthy teeth and oral structures from damage or unnecessary strain.